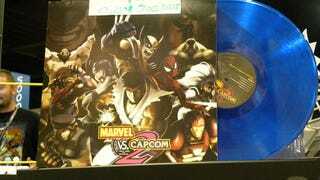 Capcom's extremely limited-edition vinyl version of the hip-hop soundtrack to Marvel VS Capcom 2 can be yours at Comic-Con 2009, as long as you're willing to shell out big bucks. While a few lucky members of the gaming public made it out of yesterday's Capcom Fighting Game panel with a copy of the hip-hop mixtape, the majority of the 200 vinyl records the company commissioned have slightly more stringent requirements for purchase. You can only get your hands on one if you spend big at the Capcom booth's merchandise area. How big? Yes, the album is free, but only if you purchase $500 worth of merchandise. While it seems like a great deal of cash, two $179.99 Mad Catz arcade sticks and you're just $140 away! That's only seven t-shirts! Surely you know seven people with torsos, right? Yeah, probably best just to wait for the downloadable version.